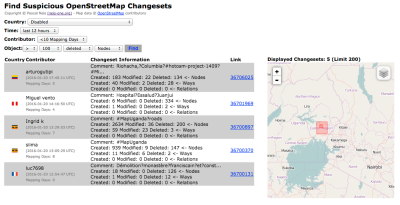 How to detect suspicious OpenStreetMap Changesets with incorrect edits? : Neis One! Based on the database which I use for multiple other services, I created an easy to use webpage to find suspicious OSM changesets with possibly incorrect map edits. The webpage offers some filter options such as the boundary of a country or the object change of interest. In contrast to the other aforementioned webpages you can also filter changesets based on the active “mapping days” of the contributor. A “mapping day” is a day on which the contributor created at least one changeset, independent from the registration date. I am also planning on adding additional user reputation information such as used editors or tagging behavior. And of course I am going to add some RSS feeds in the next version. The first version can be found here. What makes all of this different from other tools? Well, I think one of the major advantages is the simplicity of the webpage and that you can filter changesets based on the contributor activity and/or the changeset edits. In contrast to other tools, you can find changesets not only based on your area of interest, but also based on potential beginner mistakes and hopefully not vandalism attempts or fictional/ none existing map data. Great work! This kind of information is crucial for the continuing success of the project as it attracts new contributors. Also useful would be the ability to flag changesets for review. HI. Really usefull. Could you also put link to achavi? It shows what changed much better. Hi Marián, great idea. Just added. Great! Can you enhance it that in select box with deleted/created/modified will be “any” and the same for nodes/ways/relations? So I can review work of any newbie? Hi Miroslav, also good idea. Added. Very useful tool. It doesn’t show the changeset comment anymore unfortunately. Am I doing something wrong, or is this part of the tool broken? Thank you very much for noticing, there was something broken. Has been fixed. That was quick! Thank you for the lightning fast repair. Nice tool. It would be cool to see edit frequency for a user across multiple changesets. So for example if someone makes 1000 changsets in a day with 10 nodes each, it will be just as obvious as 10000 nodes in 1 changeset. Filtering by node/way creation/deletion rate would also be nice. Thus it would would be easy to spot obvious automated mass edits.